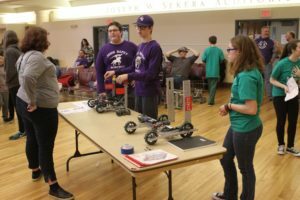 John Bapst hosted the first VEX Robotics Tournament of the academic year on Saturday with over 25 teams from several schools participating. 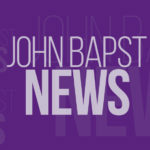 All five John Bapst teams represented their school well, both in terms of sportsmanship and overall competition. Overall, 25 robot teams attended the meet. At the end of the qualifiers – 63 matches – John Bapst held 1st, 2nd, 4th, 9th, and 18th places. In the competition there are four major awards that are presented to teams for their accomplishments. 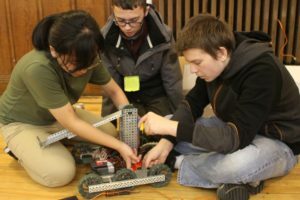 Robot Skills Champion: Ranking of a robot’s scoring ability solo on a field summing both driver control scores and programming controlled scoring.Design Award: Awarded to the team with the best overall design process. It is judged based on a careful review of the team’s engineering notebook, and an interview process. Design Award: Awarded to the team with the best overall design process. It is judged based on a careful review of the team’s engineering notebook, and an interview process. Tournament Champion: This award goes to the two team alliance that comes out on top in a single elimination bracket match-up following the qualifiers. Excellence Award: The Excellence Award is the highest award presented in the VEX Robotics Competition. This award is presented to a team that exemplifies overall excellence in creating a high quality VEX Robotics program. This team is a strong contender in numerous award categories including Design, Robot Skills and Qualification match ranking. The Judges Award is awarded to a team the judges feel deserves some special recognition, but has not qualified for the higher awards. Typically this award is given to a team that has demonstrated a unique approach to problem solving, or has faced some unusual challenges that they have found a way to overcome. The Sportsmanship Award is given to a team that shows a helpful attitude towards other teams and is friendly and supportive during all phases of the competition. Official results from the tournament can be found HERE. Team 2142E took two spots, Tournament Finalist and top Skill Champion (78th in the world out of 1200 currently). 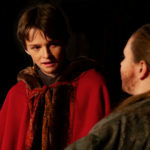 If you see HAYDEN O’CONNELL or ELLIOT COLLINS in the hallway this week, please give them well deserved congratulations. Team 2142C took the Tournament Champion spot. 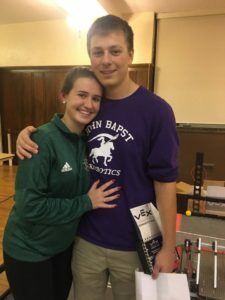 While they were assisted by MSSM, most of the finalist matches they won were won without the help of the MSSM robot, which was out of commission until the final match-up against 2142E and the robot from Cape Elizabeth (56J). 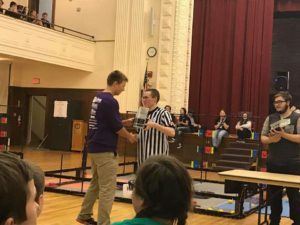 Captain LOGAN ECKMANN, was the sole representative from his team on Saturday, and he managed to finish the qualifiers undefeated, thanks to his spectacular driving skills and the simple but extremely effective robot design created by CHRIS CHAPPELLE (not able to attend the event). If you see either of them, please be sure to congratulate them for a very well earned victory. I would also like to extend special thanks to Dell Hambleton and Mike Dudley who stepped up to judge this event. Their work was swiftly and adeptly done with a high level of quality and efficiency. I could not have held this event successfully without them.